Following on from this elobeatlesforever (elobf) article published earlier this week, Sandbag (the official merchandising agent for Jeff Lynne's ELO) announced an indefinite delay in the release of the Electric Light Orchestra classic Jeff Lynne penned 2LP picture disc set for "Out Of The Blue" (889854561611) in an email to customers issued yesterday afternoon (Friday 29th September) citing "manufacturing issues". Yours Truly KJS notes with interest that amazon.com are now quoting Friday 24th November as the new release date (and a price increase) for this much anticipated commemorative vinyl set. 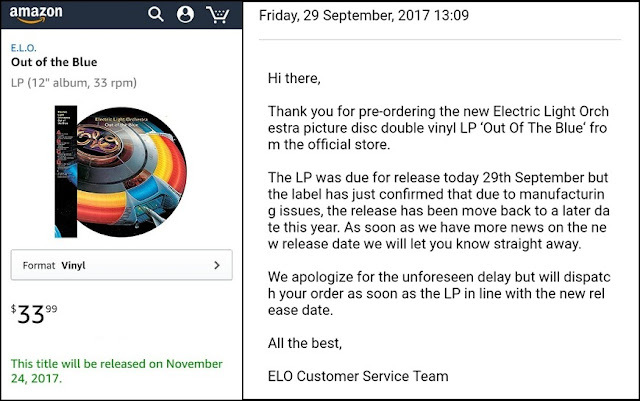 Although frustrating for ELO fans and collectors alike, we should be confident that this particular OOTB treasure will be in our hands well in time for Christmas. elobeatlesforever (elobf) recommends "Out Of The Blue" by Electric Light Orchestra to those enlightened folks who enjoy the music of ELO, Jeff Lynne, Roy Wood, The Traveling Wilburys, The Move, The Idle Race, 'Brum Beat', The Beatles and related artistes. Concept Theory: Time as a 2LP Too?